Customer Relationship Management (CRM) is a very corporate concept, isn’t it? When I Googled it, I was practically slapped across the face with business jargon. Yet, if you get beyond the jargon, you’ll find that CRM is a really neat idea, one that is useful to ANY type of organization. Just replace the word “Customer” in Customer Relationship Management with whatever you want – user, patron, citizen, fan, donor, volunteer, advocate, etc. – and you instantly tailor the strategy to your organization. In last week’s post, I imagined a history in which Marie Antoinette used a social CRM. For Marie, I guess it should be called a Citizen Relationship Management tool. 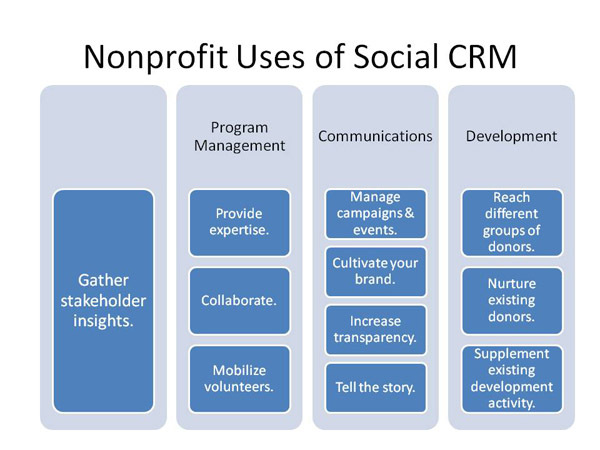 This week, we’ll take a look at how nonprofits can take advantage of social CRM. For this, just replace the C in CRM with any type of nonprofit stakeholder -- volunteer, donor or board member. With the C in CRM tailored to nonprofits, I wanted to take things even further. Back in March, Jeremiah Owyang and his buddies at the Altimeter Group published an information-packed report on social CRM. Inside the report, they sketched out 18 use cases of social CRM. I found the diagram particularly helpful in figuring out where and how to use social CRM. So, in the spirit of tailoring, I’ve mocked up some specific uses for nonprofits. Gather stakeholder insights. Like the Altimeter report, we believe that all social CRM implementations must begin with listening. So, start listening and monitoring your social media networks to learn and understand what your stakeholders are thinking, doing and supporting. Social CRM is also a great tool to help you further your programmatic efforts. Since your nonprofit’s programs get at the heart of your mission, this is one of the most important pieces of your organization to share with stakeholders. Provide expertise. Provide stats and facts related to your cause that will inspire people to action and conversation. A great example is the KaBOOM! Facts on Play campaign (pdf), where their social media manager sent out a new fact each day to her stakeholders via social networks. Collaborate. Work with stakeholders or other organizations to further your mission. Ashoka’s Changemakers program allows stakeholders to design programs. Mobilize volunteers. Encourage people to all take a specific action on a certain day; for example, cleaning up parks on National Volunteer Day. Communication and marketing via social networks allows you to demonstrate the value of your mission to stakeholders every single day. Manage campaigns and events. There’s a reason Barack Obama turned to social CRM tools when he ran for president. It’s a great way to organize large numbers of people around a campaign (for president) or your organization’s next 5K run. Cultivate your brand. Increase your brand recognition and your brand personality with your presence on social networks. Want to read about how brand personality leads to more donations? Check out Sarah Durham’s book Brandraising. Increase transparency. With social CRM tools, organizations can respond to their stakeholders in quick, clear, personal ways. It’s also great for crisis management. See how the DC Department of Transportation used it after the 2010 snow storms. Tell the story. There are so many ways to communicate your mission to stakeholders, but adding names, faces and compelling narratives often does the trick. Follow @goodshepexec, Shannon Steene, for some great ideas on how to tell a good story to stakeholders. Even your development efforts can be aided by social CRM tools. Use the tools out there to find, manage and nurture your donors. Reach different groups of donors. With your efforts in the other use cases described above, you’re bound to reach new audiences. Use metrics to determine the rate of growth of your community, locate them geographically and measure the success of your campaigns. Nurture existing donors. Reach out to your existing donors by offering follow-up information about the programs they donated to. Donors Choose does a great job of spotlighting recent donors on their homepage. Supplement existing development activity. Use social CRM tools to help aide the work you’re already doing on other channels. Re-use messaging, link to new updates on your website or encourage people to sign up for your newsletter. In the business world, a common sentiment about social CRMs is that it is entirely new territory. Corporations, who are used to traditional Madison Avenue, top-down marketing campaigns, find that social CRMs are not their specialty. Here, nonprofits have a clear advantage over their for-profit counterparts! Hurrah! Since nonprofits have always required stakeholder support, they’ve practiced the various kinds of outreach described above. While the examples are not new, the medium is. Learning a new technology is not always easy, but Small Act is here to help. Sign up for Thrive to manage your social media presence across the social world. Talk to our consultants for help making these uses a reality at your nonprofit. Ready to get started? Begin by gathering stakeholder insights. Set up a keyword search on Thrive and Google Alerts for your organization. Include keywords that reference your organization’s name and words or phrases pulled from your mission. Find and connect with your existing contacts on social networks. If you’ve got a list of email addresses of your closest stakeholders, we can import them into your Thrive account. Did I leave anything out? Have you got any questions? Let me know! Please leave comments, feedback or (better yet) tell me how you’ve used social CRM tools to help your nonprofit!